One of Cruz's ads tells viewers O'Rourke is "more extreme than he wants you to know." Another highlights Cruz's work on the state's recovery from Hurricane Harvey. Editor's note: This story has been updated with information about a third attack ad from the Ted Cruz campaign. U.S. Sen. Ted Cruz, R-Texas, has started airing the first TV ads of his re-election campaign, including one that highlights his work on the state's recovery from Hurricane Harvey and three others that take aim at his Democratic opponent, U.S. Rep. Beto O'Rourke of El Paso. The Harvey-themed commercial is airing in Beaumont, while the O'Rourke attack ads were found to be on the air Friday morning in Abilene, Corpus Christi and Lubbock. In a news release, Cruz's campaign highlighted only the Harvey spot, and it did not provide any information about how much it was spending on the ads. One of the anti-O'Rourke spots tells viewers he is "more extreme than he wants you to know," pointing to comments O'Rourke has made about his support for impeaching President Donald Trump while also highlighting the movement among some liberal activists to abolish U.S. Immigration and Customs Enforcement. While O'Rourke initially expressed openness to doing away with ICE, he has more recently rejected calls to eliminate the agency. The commercial goes on to claim such positions put O'Rourke to the left of liberal boogeymen such as House Minority Leader Nancy Pelosi and U.S. Sens. Bernie Sanders of Vermont and Elizabeth Warren of Massachusetts. "If Beto O'Rourke's positions are too extreme even for them," a narrator says at the end, "he's just too reckless for Texas." It's not the only Cruz ad that invokes O'Rourke's past comments on the abolish ICE movement. Another one brings up the remarks after reviewing the cases of three men who were in the country illegally, were deported multiple times and either convicted or accused of crimes after returning again. "But Beto O'Rourke said our border is secure," a narrator then says. "That's why he's open to abolishing ICE." The other anti-O'Rourke spot focuses on a bill from Cruz that President Donald Trump signed into law last year that expanded the number of unemployment benefit applicants that states can drug test. A narrator then seeks to contrast the law with O'Rourke's successful effort on the El Paso City Council in 2009 to amend a resolution to urge for an "open, honest, national dialogue on ending the prohibition of narcotics." "Beto O'Rourke said we should consider legalizing all narcotics, including heroin — that would be destructive to our communities and families," a narrator says. "Texas needs a senator who’ll lead the fight against drug abuse, and help those in need get back to work." 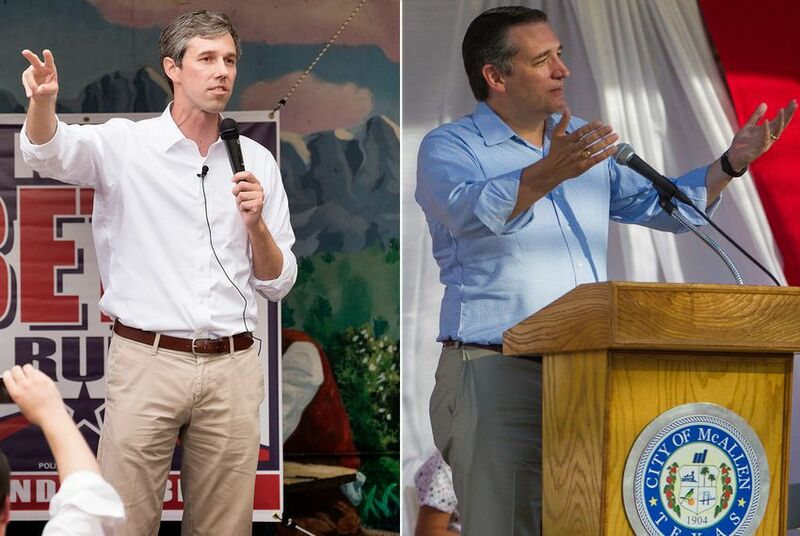 Cruz has previously attacked O'Rourke over the resolution, which was eventually vetoed by then-El Paso Mayor John Cook over concerns it could cause the city to lose out on federal funding. O'Rourke has long supported marijuana legalization but has not advocated for ending the prohibition on other drugs. At the time he amended the resolution before the city council, he said he was not calling for legalizing all drugs but looking to have a "serious discussion about that." O'Rourke responded to the drug-related ad Friday by tweeting a clip from a June 29 appearance in San Antonio where he discussed a number of attacks he was anticipating from the Cruz campaign. "They will tell you, because I want to end the war on drugs and end the prohibition on marijuana, that I want to do some terrible things like legalize crack cocaine and give your kids heroin," O'Rourke said at the event. "Nothing could be further from the truth." The other TV ad Cruz began running Friday is more positive. It touts Cruz's involvement in passing Harvey aid in Congress and shows media coverage of him visiting affected communities after the storm devastated the Gulf Coast last year. It also features a clip of Cruz at a news conference standing next to Galveston County Judge Mark Henry, who says, "No official, state or federal, has been more involved in the recovery of Galveston County than Sen. Ted Cruz." "When the hurricane hit, you stood up for Texas," a narrator concludes, "and Ted Cruz stood up for you." O'Rourke's campaign released its first ad last month, though it was only online. The candidate has expressed ambivalence about the effectiveness of TV ads in the race. While Cruz's campaign did not reveal the negative ads in its news release, it made clear in a subsequent statement that it would not shy away from offering contrasts with O'Rourke. "Between now and November, Ted Cruz will be informing voters of his own record of accomplishment as well as the stark differences between him and his opponent," Cruz spokeswoman Emily Miller said.